On June 16, 1991, James Hylton picked up the 4th last-place finish of his NASCAR Winston Cup career in the Champion Spark Plug 500 at the Pocono Raceway when his #48 Hylton Racing Chevrolet fell out with engine trouble after he completed 14 of 200 laps. The finish, which came in Hylton’s 588th series start, was his first since September 3, 1989, when his #49 Buick also lost an engine after 13 laps of the Heinz Southern 500 at Darlington. At the time of the race, Hylton was 55 years old with 25 Cup seasons under his belt. He’d made his series debut on July 8, 1964 driving as Ned Jarrett’s teammate, running a 1964 Ford to a 19th-place finish in the 20-car race on the Old Dominion Speedway, a third-mile dirt bullring in Mansassas, Virginia. Driving the #48 he would run as an owner-driver two years later, Hylton rejoined the series in 1966 and stunned competitors with one of the best-ever seasons by a rookie. In 41 starts, he racked up 20 Top Fives and 32 Top Tens, enough to finish 2nd behind David Pearson, who won 15 races that year. Hylton’s own first victory came on March 1, 1970, during a 500-lapper at the old Richmond Fairgrounds. In a three-hour race slowed by one caution, Hylton bested 2nd-place Richard Petty by more than 15 seconds. He’d win again in 1972, his Mercury edging Ramo Stott’s Junie Donlavey entry by one carlength in the Talladega 500. He finished 3rd in points both seasons, and from 1966 through 1977 ranked worse than 7th only twice. From 1978 onward, Hylton began to scale back, running just one more full season in 1980. From 1983 onward, he ran more than four races a year only once, preferring instead to have other drivers take the wheel. During this period, fifteen different drivers took the controls of Hylton’s #48 and #49 cars, including Greg Sacks, Morgan Shepherd, and Lennie Pond. Hylton was among just 37 drivers who showed up to attempt the 500-miler in June 1991, so everyone was guaranteed a starting spot in the race. It would be his first start of the season and his first at the track since 1982. There was only one problem: no one was sure what make of car Hylton brought. Both the entry list and the official race results indicate the #48 was a Chevrolet. But officials at the track said it looked like a Buick. “Just call it a Hyltonmobile,” said the driver to Winston Cup Scene. “NASCAR doesn’t even know what type of a car it is. They’re trying to determine by the chassis, but the chassis is so old that they don’t know, either. This is part of my whole plan.” Despite the confusion, the “Hyltonmobile” passed inspection and would roll off 35th. Starting 37th that Sunday was Randy LaJoie, who was making his first Cup start of the season. His ride was the #13 Golden Annie Buick fielded by current Camping World Truck Series owner Jim Rosenblum. On Lap 4, 24th-place starter Rick Mast’s #1 Skoal Classic Oldsmobile checked up in Turn 1 behind the slowing #42 Mello Yello Pontiac of relief driver Bobby Hillin, Jr., causing Joe Ruttman’s #75 Dinner Bell / Food Lion Oldsmobile to bump Mast into a spin. Mast managed to keep going, but a caution wasn’t thrown and he filed-in at the back. Hylton took the spot from Mast after the engine let go. The first caution didn’t come for another five laps after the #48 retired, and only because a large white chicken had wandered onto the track in Turn 1. Finishing 36th that afternoon was Bill Elliott, at the time a four-time winner at Pocono, who dropped a valve on his #9 Coors Light Ford. That same season, it would be announced that Elliott would leave Melling Racing and drive Junior Johnson’s #11 Budweiser Ford in 1992. 35th went to Bobby Hamilton, at the time locked in a battle with Ted Musgrave for Rookie of the Year, who spun and crashed his #68 Country Time Oldsmobile coming into the Tunnel Turn. Hamilton’s Olds was fielded by TriStar Motorsports, which is still active in the XFINITY Series. Coming home 34th was J.D. McDuffie in the #70 Run-A-Bout Pontiac. It was not only the first time McDuffie’s burgundy-and-black paint scheme made the field for a Cup race, but the first time the car ran after it was purchased by Marty Burke, McDuffie’s tire changer and sponsor. Three fans named Tim, Patty, and Cliff paid $1,000 to have their names placed behind the rear tires. Rounding out the Bottom Five was Brett Bodine, who was on his fifth DNF of the season in the final year Buick fielded entries in Winston Cup. Hylton made thirteen more Cup starts and finished last five more times. His final last-place finish came on February 28, 1993, when his #48 Rumple Furniture Pontiac broke the oil pan after 24 laps of the GM Goodwrench 500 at Rockingham. As of this writing, the number has never finished last in a Cup points race since - including all of Jimmie Johnson’s 527 career starts. Hylton made his 602nd and final start in a Cup points race one month later at Darlington on March 28, where he came home 34th with handling problems. But he was not at all done with racing. The next year, still in a #48 Pontiac, he came back to attempt the inaugural Brickyard 400. In 2006, at age 71, he returned to the XFINITY Series for the first time in more than two decades, finishing last the night Paul Menard won at Milwaukee. He made two more starts in the series for JD Motorsports, and on May 6, 2011 at Darlington at age 76 years, 8 months, and 10 days became the oldest driver to finish last in NASCAR’s top three divisions. He also made his lone Truck Series start at Pocono in 2011, finishing next-to-last in Norm Benning’s second truck. Hylton made a dramatic return to Cup in 2007, when the 72-year-old eyed his first Daytona 500 start since 1983. Hylton had acquired an old Richard Childress Racing Chevrolet previously driven by Jeff Burton, the #58 ironically sponsored by “Retirement Living TV,” and joined the biggest 500 entry list in recent memory. In his first run at a Daytona qualifier since 1995, Hylton found himself right where he needed to be, but lost the transmission in the final laps. Hylton returned for another run at the 500 in 2009, but when the car couldn’t complete a lap in practice, the team was forced to withdraw. 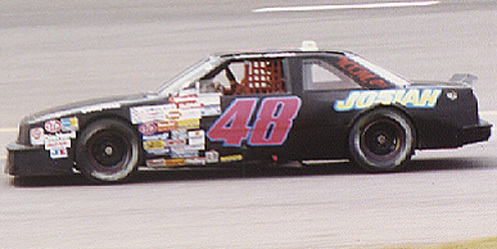 In between his NASCAR starts and attempts, Hylton remained active in ARCA, where his best finish was a 14th driving for Wayne Peterson at Pocono in 1997. Hytlon ran between one and nine ARCA races a year every season through 2005, then ran 16 races and finished 18th in the 2006 standings. Back in his #48, Hylton ran full-time in the series through 2013, earning a number of surprising runs, including a 15th at Talladega in 2009. Finally, on October 4, 2013, Hylton retired from racing. Running a throwback Belmont’s Garage theme for the Kansas Lottery 98.9 at the Kansas Speedway, Hylton finished 18th. At 78 years, 1 month, and 8 days, Hylton tied his career-best 11th in the ARCA standings. Hylton remains active in racing as an ARCA car owner. As of this writing, fellow owner-driver Brad Smith has made eight starts for him with a season-best 14th last month at Winchester. *This marked the first, and so far, only last-place finish for the #48 in a Cup Series race at Pocono. When I first got a driver's license, my dad's Chevrolet became my first car. And then I was able to earn some money and picked up a very comfortable used car Saturn, as my dad always says, needs to pay attention to the state of the engine and if it is possible to get the data of checking VIN code https://www.faxvin.com/vin-decoder/saturn. It's possible to choose the safest car, and even with a used car not to have a headache.